Each child has been given personal access to Spellingframe, where children will be able to practise their weekly spellings in focus. There are a variety of ways of helping children to learn the spelling patterns, and plenty of opportunities for the children to test their memory of spellings and patterns. Lost your login details? Just ask Mr Perree or Miss Kelly! A variety of ways to practise spelling words! 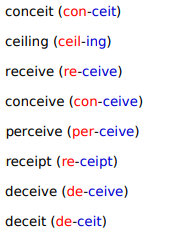 Spelling List. To be tested on Friday 8th February. Which hyphenated words would be useful in our Titanic writing this week? re-emerge, co-operate, mid-Atlantic, co-own.... can you think of any others? Suffix -able & -ible. Remember: Don't just try and memorise the words, but think carefully about the spelling rule and how it can be applied; don't forget the those rule-breakers (exception words) too! Spelling List - Week of 24.9.18 - This week's list is longer than usual, as many of the words are repeated from last week. We are continuing to focus on words with silent letters, and have worked on all of these words in class.